I have found all kinds of things while walking through the woods. That includes both public and private land. A cemetery is a new one on me though. While scouting around the CPHC we found a small cemetery in a small section of trees that were not clear cut during the logging operation before we leased the property. During a fairly recent storm an oak tree fell across the plots smashing the fences and toppling over a couple of the grave stones. 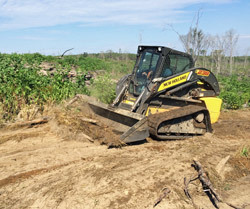 On our last work days we cut up the tree and did some clean up work on the area. More needs to be done. There were tall weeds that I treated with some weed killer right before I left. We view it as a community service project since their are undoubtedly relatives of these people buried here that might come to pay their respects sometime. In fact, using Google I looked up Annabella Tucker Graybill, one of the names on a head stone. Find a Grave came up with information from an entry made just last year. 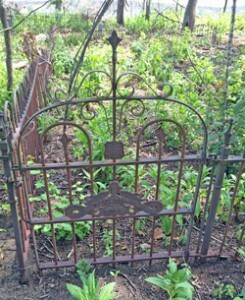 It looks like this is the Moye Cemetery. The family names on the second of two fenced grave areas are all Moyes. One example is Emma Hobbs Moye. I shot a video clip of the cemetery before heading home that shows the condition of the cemetery. I wonder how many of these exist out in the woods where they may not even be remembered or cared for any more. Have you found any on your property? 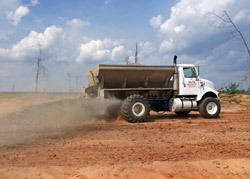 In the heat of the summer it’s time to get food plots ready for the fall. With a little help from a couple of folks we got the job done. So here’s what we did. We had already had food plots picked out and planted with some rye seed late last year. Then earlier this spring we flagged them so our property owner could double check and give us his stamp of approval. Problems crept up in that after he got the property planted in pine trees he changed his mind on us and reduced the size of our plots. In fact, the large one we had his prior approval on for dove was at least cut in half. So, no dove plot! 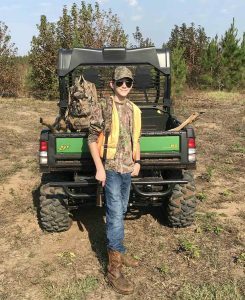 But we have moved on and will have very nice deer and turkey plots for our hunting needs. This become critical once these pine trees get up in a couple year. In this photo we have Justin with his New Holland Compact Track Steer/Loader smoothing out our plots and removing extraneous branches. He also used the tractor to move two of our towers stands to their new locations. Once Justin was done with his part of the deal we called in John at Smith Farm Supply to put down lime for us. We had the soil tested so we knew what amount of lime to put down. 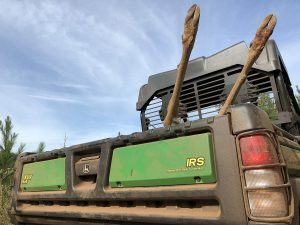 John was able to get most of our plots done but we will still have to apply some lime by 4-wheeler on a couple of plots he couldn’t get his truck into. I shot some video while all this was going on. If you’re interested to see what it looked like check out the clip below. It’s time to hunt some red snapper in Florida. And that’s just what Gary and I did over the Memorial Day weekend. We started out on Sunday, the second day of the Florida red snapper season with Captain Travis on the Bamboo Vic II. I was wearing my Google Glass to capture some footage of our trip. After starting out catching some live bait we went about 8 miles offshore to a few different spots. At our first stop, Gary caught a huge snapper. That broke the tension and from there we proceeded to get three limits: Red Snapper, Amberjack and Mingo Snapper. I also added a big Triggerfish to the cooler. Although we had great live bait we caught most of the snapper on dead bait. In fact, at our last stop we chummed up some big ones and could actually see the fish take our bait and hooks. I’ve never seen anything like it. That stop also yielded some nice Amberjack like the ones you see in the photo. 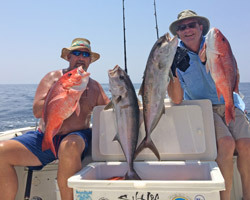 Then on Monday we did a walk on with the Entertainer from the same dock and caught a big mess of Mingo snapper. Let’s just say it was two of the best days fishing we’ve had out on the Gulf. The weather has finally settled down and the water was as smooth as I can remember seeing it. So, if you have a few minutes take a look at the video and see what you were missing. 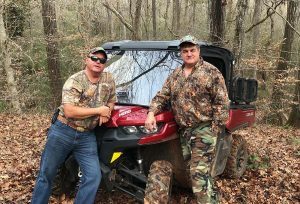 This past weekend I had another Crystal Pig Hunt Club woods experience. Unfortunately, I did not see any deer but the time in the woods is always wonderful. It was the last time for the 2013-14 deer season that I’ll be out on the CPHC but we’ve got plenty more woods time and hunting planned. 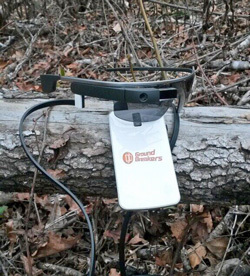 While I was hunting I carried along my new Glass from Google which is basically like a computer you wear on your face! I and learning how to use it for my business. In the photo my Glass is being recharged with a Monsanto Ground Breakers mobile charger. I have noticed that the Glass battery doesn’t last as long as I’m used to with my phone. That’s why these mobile chargers come in so handy. Earlier in the day I shot a video clip with my Glass as a test. It worked out okay and I think I’ll be bringing it back to camp in the future. The clip is from the New Holland Rustler on the new and fresh grass growing roads we’ve been working on. You know that feeling. The ache in your back after you’ve not only cut the firewood, loaded up the firewood but after you’ve also had to unload it. Well, that doesn’t happen with a New Holland Rustler in camp. We learned that the hydraulic bed makes dropping off a load of firewood a breeze. 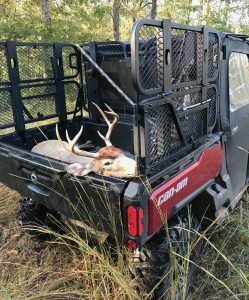 This is just one of the many ways a utility vehicle like a Rustler make hunting camp much more enjoyable. 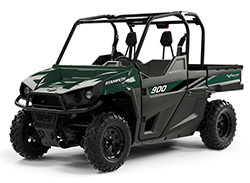 Of course you’ve already seen it picking up deer, crossing over a creek and of course it’s got tons of room to carry gear and hunters to where they need to go. You might think about getting yourself one. ‘Nuff said.